Do you remember a time during your younger years when you were stronger and hot a great body? Now that you're older, you feel yourself growing weaker. This isn't your imagination - it's a normal part of aging. After you're 50 years old, your muscle mass decreases at a rate between 1% and 2% every year. This is called sarcopenia. Sarcopenia doesn't only affect your muscle size and strength. It also decreases the function of your muscles. Do you notice you're losing muscle mass? Even if you're over 50 years old, there are ways to restore your strength. Continue reading and find out how. Sarcopenia is normal and every aging adult experiences it. The process starts at 40 years old but many don't notice a difference until they're in their 60's or 70's. The process comes from the lack of muscle fibers. The number of muscle fibers begins to decline as you age. This reduces muscle size and strength. This is because your body doesn't need as much muscle as you did when you were younger. But there are certain physical lifestyle decisions that affect sarcopenia. Some experience muscle degeneration more intensely than others or at a younger age. Others barely experience sarcopenia at all, even in their later years. Those who experience sarcopenia earlier and more intensely often have hormonal issues. This issue is more prevalent in men who don't produce enough testosterone and insulin-like growth factor (IGF-1). The best way to prevent sarcopenia is by staying active and healthy during your younger years and into your older years. But if you're already aging and are experiencing sarcopenia, you'll need some specialized therapy. Sarcopenia symptoms vary among individuals. The symptoms you experience depend on the stage of your sarcopenia and your age. Here are some symptoms you'll likely experience. The goal is to receive treatment immediately when you experience muscle loss. This will help prevent muscle degeneration later down the line. Muscle loss and weakness can lead to a series of issues. This includes mobility issues. Your physical activity will decrease, making you unable to do normal daily habits such as walking or climbing stairs. In addition, you'll risk losing your balance and even falling. If you're experiencing symptoms of sarcopenia, don't lose all hope. There are a number of different ways to treat this disorder. Here are some of the most effective treatment options. A common disorder amongst those with sarcopenia is a condition called sarcopenic obesity. This is when an individual is both obese and has muscle atrophy. In order to gain your strength back, you need to lose weight. Follow the advice below. It's also best that you hire a personal trainer who can work with both of your conditions. The most important thing anyone can do to improve their muscle fibers is by re-building them. Exercise helps manage your sarcopenia by improving your strength and preventing long-term mobility issues. Fortunately, exercising and strength training doesn't mean you need to pack on the barbell with weights (even though you can). Simple and daily exercise is all you need to keep your muscles healthy. 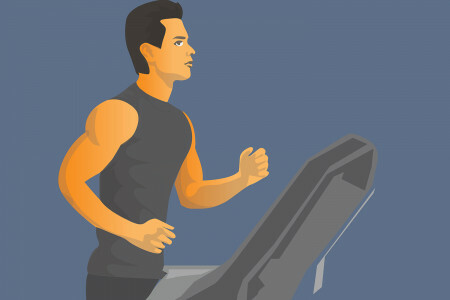 Cardio is one of the most important forms of fitness for your muscles. Jogging helps your mobility and strengthens your muscles and their functions. Cardio also strengthens other core muscles, including your heart and lungs. Your heart needs to deliver oxygen and blood to the muscles in order to function properly. Strength training is also necessary. But if this intimidates you, then don't lift too heavy. Try light weights and resistance bands. The goal is to build muscle but you don't have to build a lot of muscle all at once. Work your major muscle groups a few days a week and use lots of repetitions (15 for each exercise). Protein is the muscle-building vitamin. In order to deliver the most nutrients to your muscles, you need a protein-packed diet. Like exercise, high protein intake helps combat sarcopenia. Incorporate more meat such as chicken, fish, and red meat. If you don't eat animal products, focus on soy and whey products. Beans and nuts are also great protein alternatives. You should also avoid certain foods. The last thing you want to experience is unnecessary weight gain. Avoid eating sugar and lots of carbs. Carbs are energy sources that turn to fat. It's best to get your carbs from nutrient-rich whole grains and not sugar. Stay away from basic carbs such as fried foods and white bread. For some, exercise and a good diet aren't enough to rebuild your muscles. This is when hormone replacement therapy comes in. Remember when we mentioned the significance of growth hormones? These are key reasons why some develop sarcopenia earlier or more intensely than others. If you don't have enough of these hormones, retaining muscle mass will be difficult. Lack of IGF-1 is one of the leading reasons for sarcopenia development. IGF-1 is a protein that works reproduces and regenerates growth cells. If you don't produce enough IGF-1 naturally, you'll need the optimum growth hormones injected into your system. In addition, sermorelin therapy will also benefit muscle growth for those with sarcopenia. Sermorelin is a peptide that assesses growth hormone production. Sermorelin is beneficial for aging individuals with sarcopenia because it also helps improve many aging ailments. Hormone replacement therapy is traditionally administered through an IV. But you can take hormones in supplement form. You can take the growth hormones IGF-1 and sermorelin as a supplement. They also make other hormones as supplements, such as testosterone. As an aging adult, muscle atrophy isn't your only concern. There are physical conditions that can impact your sarcopenia. This can worsen your condition and make treatments such as exercise difficult. Talk to your doctor if you have any kinds of these issues. Exercising is difficult if you have heart disease. Your heart can't function properly, not delivering enough oxygen and blood to the muscles. It's also difficult to do certain exercises with a bad heart, such as cardio. If you have diabetes, your diet and physical changes may impact your sarcopenia. Always discuss your diet and exercise with your doctor. If you're considering HRT, make sure you get approval from your doctor. Increased activity can help improve lung disease but certain types of exercise is still not easy for those with lung disease. If you have difficulty breathing during cardio, switch to light weight lifting or yoga to help build muscle. Painful joints can affect mobility, which decreases activity levels and worsens sarcopenia. Fortunately, light activity such as jogging can improve both sarcopenia and decrease your arthritis pain. Make sure you don't do any heavy lifting. If you suspect your sarcopenia is due to a hormonal imbalance, HRT will help restore your human growth hormone levels. No two people experience the same HRT effects, especially for men and women. But you may start feeling the effects as little as a couple of days after starting HRT. While you won't gain huge bodybuilder-sized muscles, you'll notice a little more definition in the major muscle groups. To truly notice the difference, such as improving your strength and mobility, it might have to take a few months of treatments. Since you'll be under the supervision of professionals, there's little chance you'll experience any side effects. If you do, they're common and doesn't mean there's anything wrong. Here are some side effects you may experience. If any of these side effects persist, call your physician. HRT isn't intended to fully replace your hormones. Instead, HRT uses a small amount of the hormones to help your body achieve its natural function. Doing this helps prevent serious side effects. As you age, your body stops producing the hormones it once did. HRT strives to regulate the process, preventing muscle atrophy and helping you gain your strength back. HRT has other benefits. It prevents cardiovascular risks and type 2 diabetes. Are you an aging adult who is losing muscle mass? If you're showing symptoms of sarcopenia, you need to improve your muscle strength. Ignoring sarcopenia results in mobility loss and can result in injuries. Fortunately, you can reverse sarcopenia and prevent any future damage. Most people develop a diet and fitness routine to improve muscle strength and lose weight. If your sarcopenia is due to a hormonal imbalance, HRT will help restore your growth hormone levels. You'll be healthier and you'll feel better. Click here to enroll in our HRT program.